I’ve been making variations of this vegan Carrot Ginger soup recipe for over ten years. The inspiration came from a former co-worker from South Africa that I met while working as an English teacher with Berlitz Language School in my early years in Berlin. The recipe she gave me after a dinner party was for Carrot Ginger Pumpkin soup. I’ve modified it over the years to include potato (for a vegan creamy texture) and use soy milk instead of cream. I often use other vegetables (in this case zucchini) instead of pumpkin. I love to cook with what I have in the kitchen, and I change up this soup accordingly all the time. This is an all-year soup that you can vary in thickness and spice according to weather and whim. Like thicker soups? Easy: add less water. Not in the mood for thick wintery soup? No trouble: increase the water and/or soy milk slightly. It’s also easy to make a more Indian version by increasing the appropriate spices, and I’ve even turned this into a sort of dal (lentil) fusion soup using a cup or two of boiled red lentils along with the vegetables before puréeing. If you want a more European and less Asian soup, replace the cumin and coriander with fresh thyme, basil, rosemary and add some tomato paste or 1 chopped tomato. This soup works great as a starter served along with a healthy salad (such as my Arugula Pear Walnut salad favorite) warming up to a nice, hearty meal. It impresses guests every time and everyone always asks for more. You can double the soup and have enough for several days (you won’t get bored of it, especially if you have plenty of good bread, tasty crackers, or your own tasty croutons.) It can also be frozen and kept for a quick, delicious future meal when you’re too lazy to cook. Do you have any other suggestions or ideas? Share your thoughts and experiences! Heat oil in a large pot on medium heat. Add garlic, onion, ginger, pepper, cumin, coriander, paprika, turmeric, nutmeg. Mix, fry until garlic and onions are slightly browned, about 3 min. Add carrots, potatoes, zucchini. Mix well with spices, cook 5 min. Add lemon juice, wine. Stir regularly, cook partially covered, until veg is soft and cooked, 5-7 min. Turn off / remove from heat. Purée veg to creamy pulp with immersion blender. Return to medium heat. Add soy milk, broth powder, nutritional yeast, salt. Stir well, simmer 2-3 min. Add water gradually, stirring regular, maintain low boil, cook for 5 min. Continue to cook on medium low, reduce to desired consistency. Garnish with fresh parsley, crumbled nuts, sprinkled paprika, ground pepper. Serve with bread or crackers. 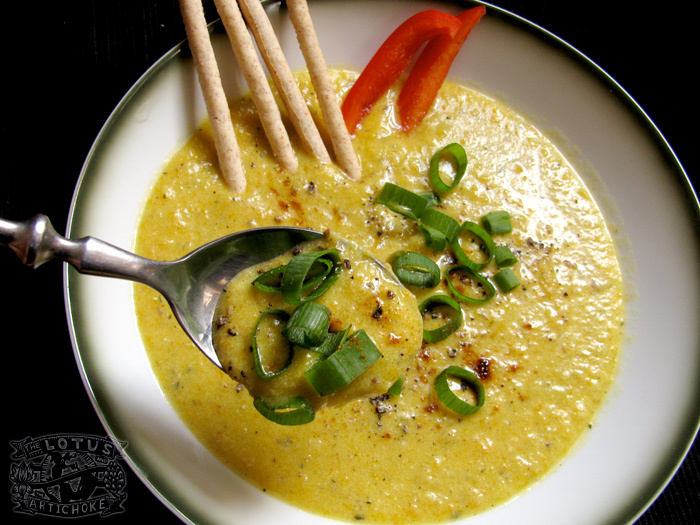 Vedic style / No garlic and onions: replace with pinch asafoetida (hing), 1/2 tspn brown mustard seeds. Nutty taste: add 1/4 cup lightly toasted ground sunflower seeds with nutritional yeast and broth powder. Straight-up Carrot-Ginger: Use 2 or 3 more carrots, omit zucchini. Alternately, replace zucchini with 1 or 2 cups chopped pumpkin. Potatoes can also be replaced with sweet potato or more carrots. Euro-herbs: use fresh basil, thyme, rosemary instead of cumin and coriander. Add 1 Tbs tomato paste and/or 1 chopped tomato for a slightly richer, fruitier flavor, too. 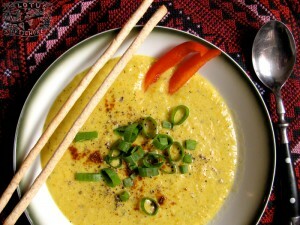 This entry was posted in Soups and tagged carrot, ginger, potato, recipe, soup, vegan, zucchini. Bookmark the permalink. This looks delicious! Something I definitely want to try cooking. Simply amazing! It had so much flavor… I didn’t have soy milk, so I used almond milk instead and it still came out great. Wish I could send you a pic of my finished product. Definitely sharing this recipe to friends. Thanks Nikki! Yes, Almond milk works great for soups, too. I’m glad you enjoyed it and very happy to hear you’ll be sharing it with friends. I made this soup a couple of times now. It’s one of my favourites, specially in fall and winter. Thanks so much for sharing. I think this is the fourth time I am making this soup — in four weeks! I cannot get enough of it, thank you!!! I cook a giant pot on Sunday night that lasts me through Wednesday. Fantastic! Gracias! Danke!